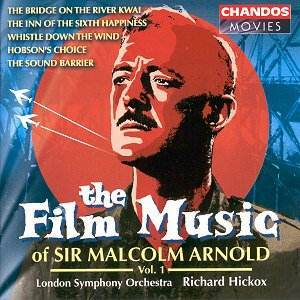 Suites: The Bridge on the River Kwai; Whistle Down the Wind; Hobson's Choice; The Inn of the Sixth Happiness (all arr. Palmer). The Sound Barrier, Op. 38. Recorded in 1992 and first issued on CHAN9100, this first volume of film music shows just how inventive Malcolm Arnold can be. Christopher Palmer (who is the arranger of four out of the five items on this disc) points out in his excellent notes that, 'Arnold is not afraid of the obvious, nor does he avoid clichés or mannerisms'. This is certainly true: Arnold's musical vocabulary takes in whatever he feels to be apposite to the situation, surely a point which reinforces his stature as a composer of film music. All but one of the scores are arranged for concert use by Palmer. The longest and most famous, The Bridge on the River Kwai, is possibly also the most successful. Effects are larger than life: the music is grand and with real sweep. Arnold persuasively uses enormous contrast between the famous Colonel Bogey movement (the tune is actually by Kenneth Alford) and the sparse, evocative Jungle Trek that follows. The fourth movement, Sunrise, is a moment of repose in the film, and Arnold shows himself capable of depicting the utmost peace. There is a cinematographic power to all of this music, and it is a tribute to Palmer's skill as an arranger that the suites all work as entities within themselves. There is little doubt that the LSO enjoys its foray into this territory: the Hollywood-like sprawl of The Inn of the Sixth Happiness or the unashamed soupiness of parts of Hobson's Choice demonstrate this perfectly. Only The Sound Barrier, Op. 38, is completely by Arnold himself. Originating in 1952 from the score to a film by David Lean, this was Arnold's first important film score and is only one of two compositions in which Arnold himself has been transcriber (the other, Machines, is available on an all-Arnold disc which includes the Fifth Symphony on Classico CLASSCD294, played by the Munich Symphony Orchestra under Douglas Bostock review). Arnold's adaptation of The Sound Barrier is wholly successful. The LSO play with true conviction and, at times, a real sense of fun. Arnold fans who missed this CD the first time round should not hesitate.